The March meeting concentrated on getting the scenic boards and track bed in place and positioning a new version of the back scene to check for height and scale. 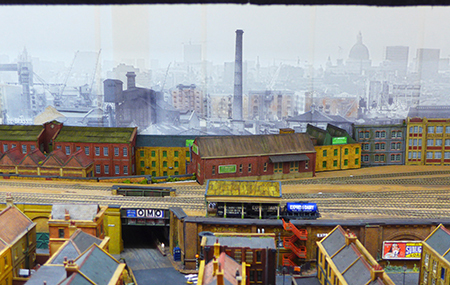 Richard has reworked the London back scene to show greater depth by adding a more focused and lightly coloured middle distance against the more distant hazy background. This works well behind Pete T's low relief buildings at the rear of the track bed. Pete T also provided a solution for holding the back scene in place. Four 18" upright supports fixed to the white base units with a nylon bolt and wing nut, and a locating pin. A spacer was added to provide a small separation from the low relief buildings and background and look more natural. 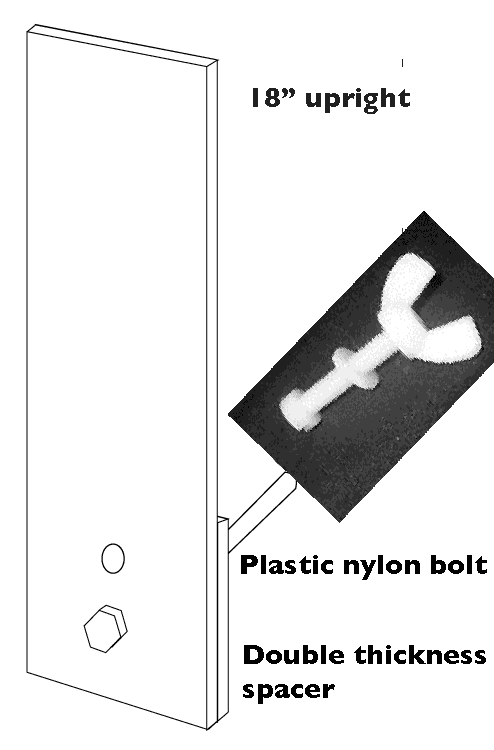 The back scene is held in place with clear plastic clips. The back scene will be printed digitally onto a thicker material and backed if necessary to prevent any back light effecting the image. 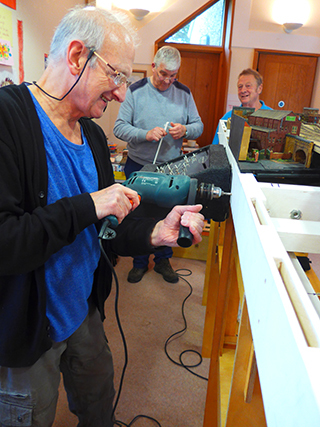 Pete K drilling the fixing holes while Pete T prepares an upright support. We decided four uprights is sufficient to support and hold the back scene in place. 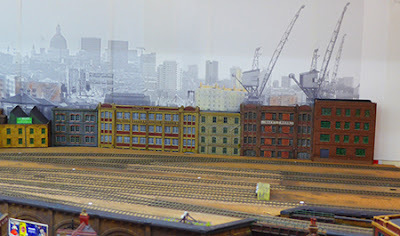 Three images of the back scene in place. 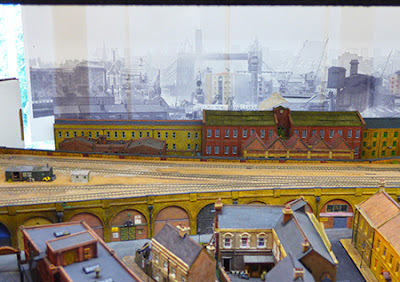 The left hand end of the background image (to be completed) will curve round the end of the shunting yard, probably attached to a thin ply sheet in front of which there will be a low relief warehouse frontage. Shunting crew's hut and shed shown in place. The middle section shows the Express Dairy unloading dock. The right hand end awaits the completion of a large warehouse. 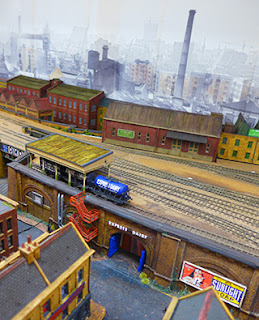 Pete T produced the Express Dairy unloading dock and the stairway down to the archway entrance for milk floats. Following a discussion at the February meeting, Richard photographed the large curved warehouse at Queens Road Battersea and made a scale drawing. 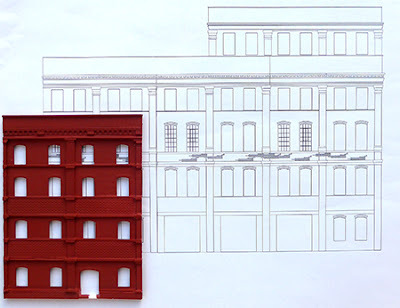 Each section is identical and suggests a resin casting of multiple sections would be a way of modeling the large building and maintaining the curved frontage required for low relief building beyond the wall at the left hand end of the layout. Based on the drawing, Pete T has made a mould master for the repeat section.